Coming in at number 5, the Leaning Tower of Pisa is facing an existential threat. Either the list becomes 8, or Italy’s famous piece of shoddy 12th Century engineering gets usurped by a 290 tonne (formerly) whirling Danish Dervish. 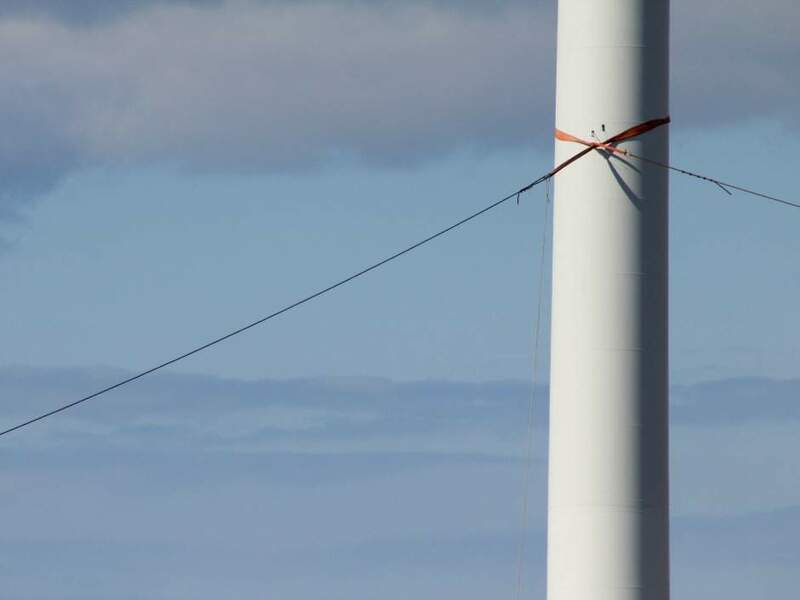 Another vertically vulnerable Vestas has taken to slouching on the job, and the ‘solution’ is so much ‘old rope’. Here’s the latest on Wiatron Ontario’s bid to host the 8th Wonder of the World. 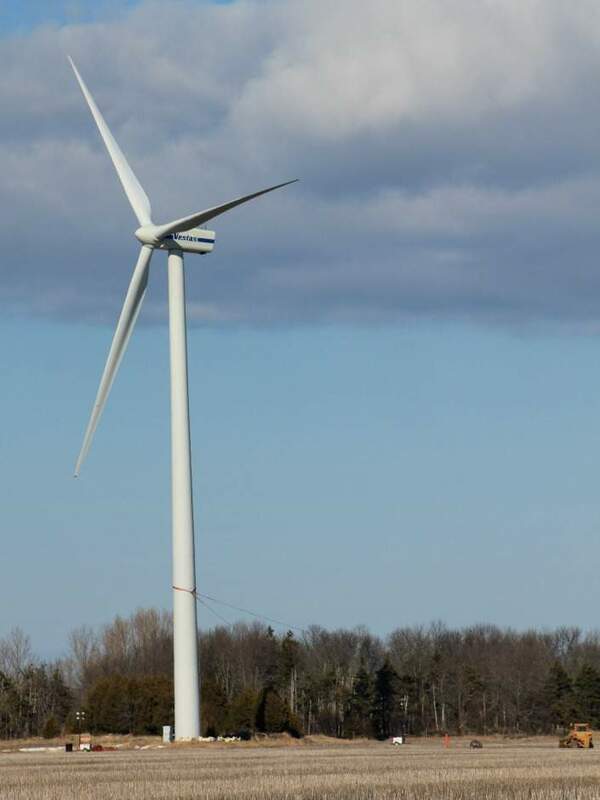 Work continued on Wednesday to stabilize a turbine that is leaning at a Ferndale wind farm. Capstone Engineering, which owns the three-turbine facility, discovered last week that the turbine, constructed in 2002, was listing and officials and engineers from Vestas, who manufactured the turbine, began working on site on Tuesday, along with Capstone staff and consulting engineers, to stabilize the structure. 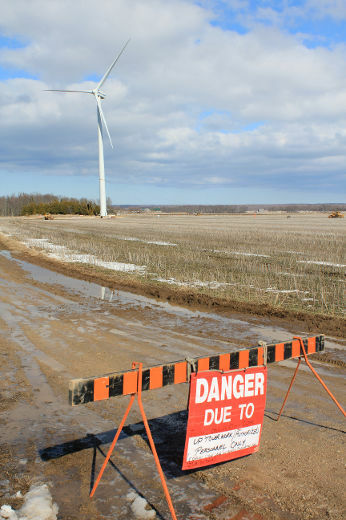 Crews had tethered the turbine, and Boles said there was no risk to public safety as the 115-metre high turbine was 400 metres away from the closest structure and 900 metres away from the closest road. Twenty-four hour security has been placed at the site. Boles said Wednesday that as crews worked to stabilize the turbine, work was also being done to analyze what potentially caused the turbine to lean, and to then arrange a solution. Boles also said having the 1.8-megawatt turbine offline “is not consequential or material” from a commercial perspective. The turbine that is listing was constructed in 2002 and first achieved commercial operation in November of that year. Boles called it one of the earliest turbines to be constructed in the province. Two other turbines at the site began operation in October 2006. Capstone Infrastructure took ownership of the Ferndale wind power facility in 2013 when it acquired Renewable Energy Developers Inc. So comforting to hear that having a 290 tonne turbine on the topple doesn’t pose any threat to safety. And those hundreds of homes hoping to be ‘powered’ by Capstone’s wind farm (as promised) can rest easy too, knowing that the ‘loss’ of a once ‘upstanding’ member of the team “is not consequential or material”. So, what was the point of the fat pile of subsidies it’s pocketed and the misery caused to neighbours? No? We’re at a loss, too. What amazes me is the absolute stupidity of considering the use of a few ropes around the tower to ‘stabilise’ it is helpful. This is another of the industries fanciful imaginations – just look at the picture the heaviest part of the tower – the nacelle and blades – are way above where the ropes are, they will be putting a great amount of pressure on those flimsy little ropes way down below – if it doesn’t fall over completely or bend at the ropes it will be a miracle – the first this industry and probably the only type of miracle these turbines could achieve regardless of all the promises and lies we are told by the industry and its minions . Just when you think you’ve heard it all about the great wind farm scam, along comes this story! What next? Who thought this was a good idea? Let’s take a highly complicated piece of machinery, a wind generator filled with flammable oil lubricants, and place it in a confined space right at the top of a tall tower where no one can reach it! Well not in a hurry anyway. And to think the Greens would rather see a paddock full of wind turbines than a woodland full of trees. How did we get to this point in history? We should be developing a 21st Century system for putting out bush fires. We can drop a bomb and destroy an entire city, and yet we cannot put out a Black Saturday scale bush fire. If we can control fire to a greater extent, then not only can we save lives, but we can also plant more woodland trees. On another point, a recent story of interest shows proof that wind farms are changing the climate. Make of this what you will. But to my mind it raises more questions than it answers. It was recently explained to me that some crop growers use small diesel powered rotors to stop the frost damaging their crops on cold clear nights. The rotor shaft is angled at around 6 degrees to the ground. This is enough to pull the warmer air above the ground down so that it mixes with the colder air at ground level in an effort to stop frost forming. Some vineyards even use helicopters! Now ask yourself. What the hell do 140 (AGL) 3 MW turbines at Macarthur wind farm in Victoria, Australia do to the climate? And what of the weather downwind of the site or the moisture in the air? If I put a fan on in a damp room or turn on an extractor fan in the bathroom, what does it do? Hug a tree, not a wind turbine! I too have wondered what effect IWTs are having on weather. Sucking out the energy from weather systems, mixing the layers of cool and warm air – does this not have an effect on precipitation? on downwind arid-ness? 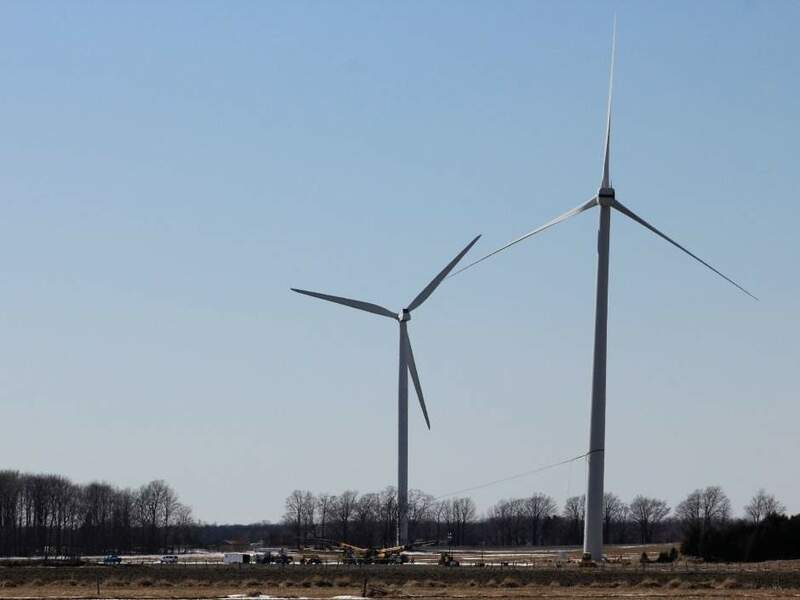 In Ontario, there will be 3mW turbines placed at 550m from people’s homes. Just call it MacArthur North! Here is a link Rural101 to some of my crop rotor research. Interesting that they mention low frequency sound. These things are tiny compared to the 110m high 2 MW turbines sitting next door to our home, the closest being around 600m away. And the wind farm operator Pacific Hydro has NO intention of shutting down the turbines at night. They just do whatever the hell they like. And here is a link to a crop wind rotor video promo. This is just one company that I found. I am sure there are many others. The photo on this page demonstrates what effects wind turbines can have on the local climate – fog generation.